Nirnroot is a bright green plant normally found growing near water. They glow, making them easier to locate at night, and also emit a unique chiming sound. While in-game text claims that nirnroot does not regrow, it actually does regrow normally like other plants. A related plant is crimson nirnroot, which has nearly identical alchemical properties (only details of the Damage Health effect differ). They can be combined to make a four-effect potion. Damage Health poisons made using nirnroot have the same strength as ones made using standard Damage Health ingredients. However, the gold value of such poisons is 12.6 times larger than standard ones. See the effect page for details. 1-2 guaranteed samples are found on several dead alchemists, including the one found at Clearpine Pond. Nirnroot can be sold to Avrusa Sarethi at Sarethi Farm for the quest Gather Wheat. Nirnroot and crimson nirnroot are not affected by the Alchemy perk Green Thumb, and therefore even with the perk, you still only collect a single sample from each plant. 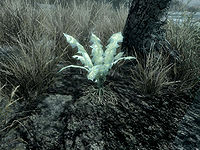 However, with the Dragonborn expansion, there are several regular nirnroot plants that can be found in Solstheim which yield multiple samples of the ingredient. An otherwise typical nirnroot plant within a hollow log on a small island east-southeast of the Wreck of The Pride of Tel Vos and due west of Winterhold cannot be harvested. At times, the glow emitted by a nirnroot may not disappear. This bug is fixed by version 1.6.87 of the Official Skyrim Patch. Sometimes nirnroot becomes unharvestable; even though the sound of being picked will play, it will not be added to your inventory, nor will the plant disappear. Saving and then reloading the game will make it harvest-able again (sometimes).